Madagascar is often called the world’s oldest island. At some 1600 km in length and nearly 600 km across it is also the 4th largest and it has a population of some 22 million souls. Of these, 70% live below the poverty line of one dollar per day. In December 2012 I rode to Ilha de Mocambique [check out http://www.wilddog.za.net/forum/index.php?topic=115033.0 ] not only to see that small island, but also to investigate the possibility of shipping some bikes across the 420 km wide stretch of the Mozambican channel to the western coast of Madagascar. 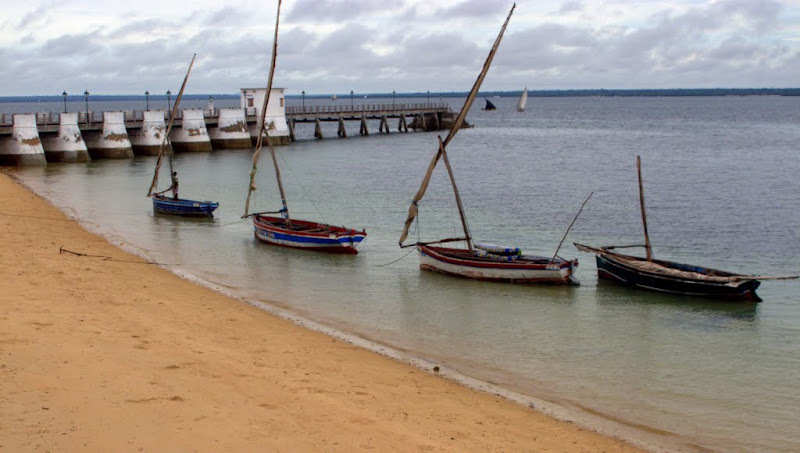 What I found did not look seaworthy enough to go any further than across the bay to the port of Nacala. So shipping is problematic, and airfreight is likely to be expensive and arduous. As you will see later on though, this place would be wonderful to tour on a bike, even if you have to do it using the small local scooters. Despite being separated from the mainland, Madagascar is considered part of Africa. Its people, however, originate from Polynesia and Malaysia as well as Africa and until 1960 it was a French colony. During World War II it was occupied by the British and the current government has been in power since the coup de etat of 2009. So much for the political landscape- but what about the physical landscape? After separating from Gondwanaland, Madagascar’s fauna and flora evolved undisturbed for nearly 200 million years until the arrival of the first human inhabitants only 2000 years ago. The result of this isolation was that nearly 80% of the species on the island are found nowhere else on earth. Although this trip entailed only one day of actual biking, come along and see what kind of natural paradise is only three hours away from our Gangster’s Paradise! Mad's my favorite destination. Have been from 'Tana South to Fianarantsoa & by train to Manakara, been to Tamatave via Moramanga & Perinet, and from Ivongo across to Isle St. Marie. Why did I drink ALL of the ingredients for vomit? From the airport it’s a trip across Nosy Be to the port of Hellville and a boat ride around the corner to Lokobe camp. It’s a twisty road that cuts through the balmy ylang ylang, vanilla, sugar cane, cocoa and coffee plantations typical of the area. A number of other South Africans have booked on the same trip, so about 14 of us are loaded onto the house boat. We slowly make our way around the south-eastern corner of Nosy Be to Lokobe camp as the moon rises over the water. Shortly after reaching camp, supper is served. Rice is the staple food in Madagascar; like mealie pap it is served in various viscosities with every meal, usually with coconut milk added. Pretty darn good. It was too dark to really appreciate our surroundings until the next morning. The tents are mounted on platforms on the slope overlooking the bay separating Nosy Be from Nosy Komba (Lemur Island). To get around these parts, locals use water taxis. There is also a ferry to get to and from the mainland, and speedboats for those in a hurry. After a quick dip, we’re off on the house-boat and the Indian Ocean passes below our bums as we head for the open water. I have been living here for 10 years. Getting bikes in and out will be expensive and the red tape will be too much. Going off road is great fun but fall and you are in trouble. You better have a sat phone to contact a chopper. Come say hello when you are here! I am usually a missionary but am currently working in the south in the Ifaty area. Where are you planning to go? And to do what? my ole man sails to Madagascar regularly ..he is on his way to Nosy as I type this. did you do church planters in SA with NCI? NCI? No I dont know them! might know him, Myndert Bloem ?? I have not had the pleasure! The first stop is the Nosy Komba reserve. For a mere R10 entrance fee we get taken for a walk in the park. There are reptiles as well, including a family of radiated tortoises. They can reach an age of over a century, but are endangered due to the loss of their habitat. Nosy Komba proves to be a great introduction to the wonderful animal kingdom endemic to Madagascar. Better go and take a look while you still can. Back on the water our houseboat cruises out into the bay opposite Nosy Be. “Nosy” is Malagasy for island and “Be” means big- so “Big Island”. There are more small islands and camp-sites dotted around the water: Nosy Sakatia, Nosy Tanikely, Mahalina, Russian Bay … The settings are idyllic, facilities are basic but unspoilt. If 5 stars are your comfort zone, this is not your scene or budget. Then get the DVD you will enjoy it. On-board, fish is the order of the day. Mostly Spanish mackerel or this large wahoo, all caught with 20 pound lines. In the galley it is rapidly converted into lunch. There’s a whole new world down there, and you don't need much more than a snug-fitting diving mask and a snorkel tube to experience it. Watch out for the coral! Hawksbill turtles, bat fish and parrot fish all feed in the underwater garden.